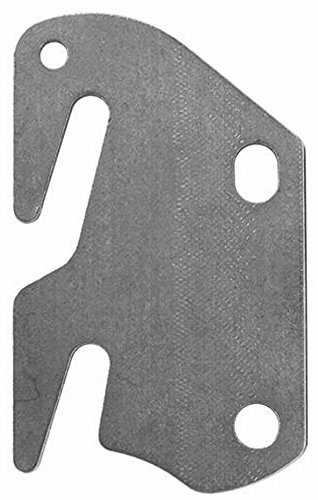 This hook plate is intended as a replacement for hook plates which have been damaged or for new bed construction where hook plate installation is desired. The hook plate will be installed on the bed rail with the hooks being inserted into the headboard / footboard in order to join the headboard / footboard to the rails. These hook plates are made with 13 Gauge steel and are the standard configuration for most American-Made beds. Please note the dimensions of this #10 Hookplate from the "Dimensions" illustration under More Views. Of special note is the distance of the two slot ends from each other, 2" on center. Please measure the distance from the two pins in your headboard/footboard to confirm that they are 2" apart on center to determine if this hook plate will work in your application. The mounting holes for the pins are 11/32" in diameter. Our Ltd. Lifetime Policy runs from the original date of purchase and covers the repair of manufacturing defects or replacement of your purchased product. Item must be clean and free of stains or damage. Transportation charges and a Policy Service Fee are the responsibility of the consumer. To email your clear images of the issue go to the Homeplace Group's storefront for our contact information. Then you will receive information on the next steps and/or additional information on this policy. This hook plate is intended as a replacement for hook plates which have been damaged or for new bed construction where hook plate installation is desired. Please measure the distance from the two pins in your headboard/footboard to confirm that they are 2" apart on center to determine if this hook plate will work in your application. The mounting holes for the pins are 11/32" in diameter. Eight Mounting Pins are included with this item. Packaged as a set of 4 hook plates with mounting pins. Plates are nickel plated to resist rust and corrosion over time. If you have any questions about this product by Bed Claw, contact us by completing and submitting the form below. If you are looking for a specif part number, please include it with your message.